Web applications are constructed using a combination of the following LANSA objects types but primarily use Web Pages, Reusable Parts and Server Modules for the core of the application. The starting point for the application. A Web Page can have references to other objects like Reusable Parts, Server Modules or Bitmaps but may also be the source of some of the User Interface functionality. A Widget formalises the use of 3rd party controls or external scripts. Web Pages or Reusable Parts access server side data by executing a request to a Server Routine within a Server Module. Information is communicated between the client side and the Server Module in JSON. 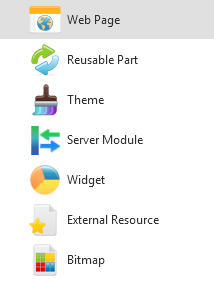 A Theme allows you to define ThemeDrawStyles and Styles that can be used throughout your application. It is a good way to ensure a common 'look' is applied to your application as fonts, colors, and so on, can be defined in the Theme. A Reusable Part encapsulates logic that may be reused at various points throughout the application. A Bitmap can be used to add images to a Visual LANSA Web User Interface. External Resources can be used to access documents or files required by the Visual LANSA Web Application.